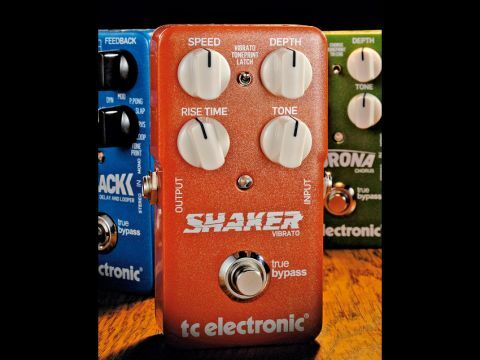 A cool pedal with an effect that's not heard as much as other modulation effects, but deserves to be. TonePrint function. Latch mode. Broad tonal range. The Shaker can be loaded with customised TonePrints. The pedal is designed to be fast and easy to use. "The Shaker's Latch function is brilliant for adding vibrato just when and where you want it." The pedal has four knobs, plus a three-way switch, and features selectable effects variations. The first position of the Shaker's three-way switch offers vibrato that can be turned on and off with the footswitch, but there's also a latch position, which allows the footswitch to apply the vibrato effect as long as you hold it down. The central position of the three-way switch calls up the selected TonePrint sound. Delivering smooth undulating pitch fluctuation, the Shaker offers cool vibrato sounds and can do a pretty good rotary speaker emulation. There's plenty of variation available - the speed and depth knobs work as you'd expect, but the tone knob changes the effect's emphasis on high and low frequencies letting you really focus in on sounds that will sit just right with your tone. The latch function is brilliant for adding vibrato just where and when you want it. It's particularly effective on a sustained note or chord - a 'rise time' knob determining how long it takes for the vibrato to reach its specified depth to provide the full effect.